Although well-performed surgery is essential to the limb lengthening and reconstruction process, without postoperative rehabilitation, patients cannot be expected to attain maximum functional recovery. Physical therapy and occupational therapy are essential to prevent complications that otherwise may arise during treatment. Rehabilitation is as important a component of the limb lengthening and reconstruction process as is surgery. Muscle contractures, muscle weakness, joint stiffness, nerve injury, and joint subluxation are all well-known complications of limb lengthening. Aggressive and frequent physical and occupational therapy and functional loading are the best ways to prevent such complications. These complications can occur during lengthening, when bone ends are separated at a rate of 1 mm per day, during consolidation, when the external fixator remains and the bone hardens, and after the removal of the external fixator. Therefore, all patients who undergo this procedure require intense and prolonged rehabilitation, without which the final functional outcome would be less than desired. Rehabilitation after surgery for limb lengthening and reconstruction can be divided into four phases. Therapy begins the day after surgery. The therapist will teach you correct positioning of your arm or leg in bed and will make splints to position your arm or leg in the correct position. You will do range-of-motion and isometric exercises under the supervision of your therapist. You will also be taught to walk using a walker or crutches and to climb stairs. Your length of stay at the hospital will be 2 to 3 days. Your therapist will teach you a home exercise program that is customized to your needs. You will be fitted with an appropriate wheelchair if necessary and other adaptive equipment on the day of discharge. During lengthening, the most important goal of therapy is to maintain as much of the preoperative joint range of motion as possible, especially of key joints. During lengthening, the muscles get tighter and restrict range of motion of the joints. External fixation pins tether the skin and underlying muscles and also contribute to this restriction. To avoid permanent loss of motion, it is essential to try to maintain as much motion as possible and to avoid developing a contracture of the joint. The second most important goal is to prevent atrophy (thinning out) of key muscles. This involves strength training during lengthening. The types of exercises depend on the bone(s) being lengthened. See specific sections on femoral, tibial, humeral, and forearm lengthening below. To achieve these goals and to accommodate individual needs and situations, we have designed three different rehabilitation pathways. This is an outpatient adult and pediatric program of one or two sessions per day, 5 days per week. This pathway is available at our Center but can also be arranged in your local area. This is an outpatient pediatric full-day program, which involves three sessions of therapy per day, 5 days per week. This program also offers nursing and educational support. The name of this program at our Center is the Kennedy Krieger Limb Lengthening Rehabilitation Program. This program is available only in Baltimore. This is an inpatient rehabilitation program that involves three or more sessions of physical and occupational therapy 5 or 6 days per week with full-time nursing and educational support (for children) combined with full-service inpatient hospitalization in an adult or pediatric rehabilitation hospital. Our adult inpatient rehabilitation program is at Sinai Hospital. The pediatric inpatient rehabilitation program is nearby at Mt. Washington Pediatric Hospital. 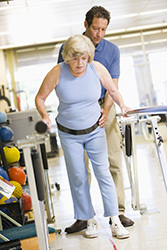 The rehabilitation pathway we recommend to you is based on your diagnosis and age. Because most of our patients come from out of state and have different levels of insurance coverage and personal resources, the optimal pathway may not be the most practical one. In such cases, we will work with you to design a pathway that still meets the rehabilitation needs of the reconstructive process. You should check your insurance plan's rehabilitation benefits before undergoing surgery. Because this is elective surgery and the surgical date can be planned long in advance, it is often possible to change your insurance benefits in advance to better cover the expected rehabilitation pathway. It is usually possible and recommended to have your insurance company pre-approve your therapy pathway. All patients undergoing limb lengthening surgery require at least one session of therapy every day. This session is primarily focused on stretching and mobilization exercises. Because therapy is often unavailable on weekends, patients should exercise on their own on those days. When we recommend more than one session per day, the second session may be water therapy. Swimming allows for increased range of motion and minimizes the load on the joints. Swimming and aquatic exercises are allowed only in chlorinated pools or chemically treated hot tubs and spas. Swimming in natural waters (lakes, rivers, oceans) is not allowed. As soon as swimming is completed, you must take a shower. Patients following the day program pathway will complete one additional session as a group exercise program that involves weight bearing and play therapy activities. During the lengthening phase, all patients are allowed to bear some weight according to their surgeons' prescriptions. Clinical follow-up during lengthening is usually every 2 weeks. Based on the surgeon's findings at the clinic visit, changes may be made to the therapy program. After the lengthening is completed, the muscles and other soft tissues begin to relax. Few complications other than pin infections are expected to occur during this phase. During lengthening, maintaining range of motion is an uphill battle because, despite the exercises to loosen the muscles and joints, the limb is continually being stretched. This tightens the muscles and tends to stiffen the joints. Once the lengthening is completed, everything begins to loosen up, even without therapy. Although one must not become complacent, therapy becomes easier and less painful after the lengthening is completed. Range of motion lost until completion of lengthening can then be partially regained. This is the primary goal of therapy during this time period. As motion is regained, frequency of formal therapy can be decreased from 5 to 3 days per week. Home exercises fill the void. The more mobile and strong the muscles are by the time of removal of the fixator, the less time will be required for rehabilitation after removal. During this phase, patients enrolled in the full-day program can switch to the 1- to 2-hour-per-day outpatient program. For many patients, this also marks the time when they can return home. Clinical follow-up is reduced during this time period, which also makes use of the outpatient program in your home area more practical. When the fixator is removed, the bone remains at risk of fracture through the lengthening segment or through the pin hole sites. Therefore, most patients who have undergone lengthening by external fixation alone have a cast applied, which they wear for approximately 1 month. Obviously, no range-of-motion exercises are performed during this time. However, some simple exercises, such as straight leg raising and quadriceps muscle isometrics, are useful to maintain the tone of the muscles. After removal of the cast or brace, we recommend that the patient participate in therapy sessions three to four times per week to restore range of motion to the preoperative level. As motion is regained, the focus is then shifted to increasing strength and training in functional activities. It is customary for patients to achieve steady gains in function and strength for up to 2 years after lengthening. It is recommended that most patients attend a health club type facility after discharge from therapy to achieve maximum recovery.